The Datsun 910 Bluebird (later named the Nissan Bluebird in Australia in 1983) was produced locally from 1981 to 1986, and was the last rear-drive Bluebird. Aesthetically it boasted clean-cut square lines in true 80s fashion. Engine options included a slew of inline-fours ranging from 1.6lt through 1.8lt and 2.0lts. This generation Bluebird eventually birthed the S130 Fairlady, and subsequently the Z31 and Z32 Z-cars. In Australia; the cars were slightly down on spec compared to the native Japanese Domestic models which gained independent rear suspension and electronic fuel injection. Engine options Down Under were a 2.0lt L-series engine initially, but switched to the 2.0lt CA20 from 1985 to 1986. The local arm of Nissan offered a sportier TR-X model which gained sportier trim, optional front air dam, 15" alloy wheels, smaller rear spoiler, and bolstered seats. This Series 1 TRX Turbo is one of six that were sent to the Nissan race team to be transformed into Nissan promotional cars. The cars gained lower coil suspension, uprated dampers and HKS turbo kits. This car, being number five of the six, comes with the registration TRX 005, and in its day was piloted by Fred Gibson at various ATCC rounds taking employees and dealer principles for ‘hot laps’. 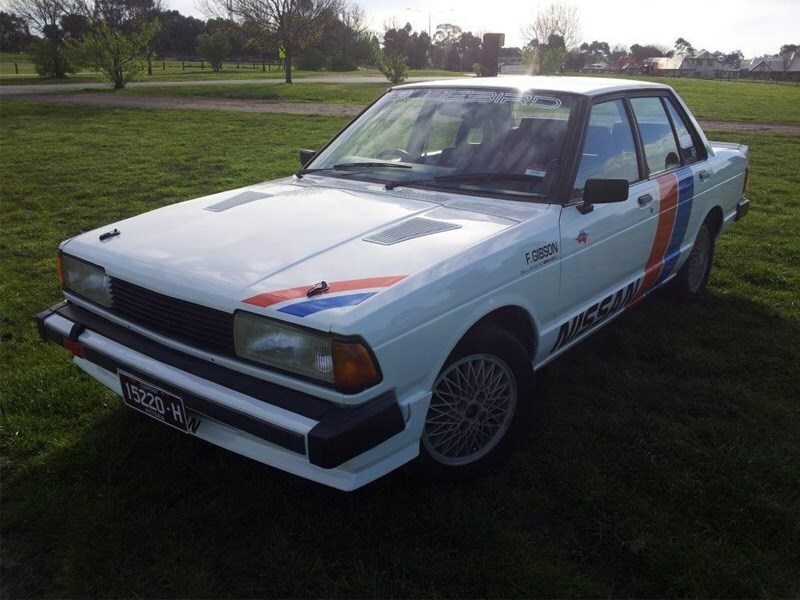 The seller reports that the car is no longer ‘matching numbers’, as the car now bears a Series II L20B engine, rebuilt by a well-known V8 Supercars engine builder. In 2014, the car was lent to Nissan and Kelly Racing as their ‘road trip’ car. The car boasts a unique history linked to Australian motorsport and many of its heroes. The car will be sold unregistered a it is currently on Club plates, but is a unique example of an already rare model – and would suit the collection of anyone with a penchant for Nissan’s Australian motorsport heritage. The car is based in Victoria, and is listed for $25,000 (with rare spare parts included on negotiation). Lap the Nurburgring, drive the Swiss Alps, and take home an Indian Scout Motorcycle!